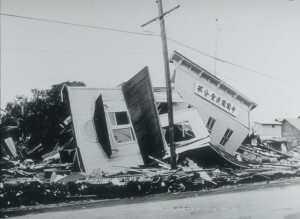 Wreckage of a clubhouse on Kamehameha Avenue in Hilo, Hawai‘i, caused by a tsunami generated by the April 1, 1946, earthquake in the Aleutian Islands. Photo courtesy of the U.S. Army Corps of Engineers. April 1, 2015, marked the 69th anniversary of the 1946 tsunami that devastated the Island of Hawai‘i, causing widespread damage and taking 159 lives. To honor the people lost in the 1946 and subsequent tsunamis, the State of Hawaii proclaimed April to be “Tsunami Awareness Month”—a time to focus attention on preparing for and taking action to mitigate the impacts of future destructive tsunamis. The 1946 tsunami was generated from a large earthquake in the Aleutian Islands, thousands of miles north of Hawai‘i. The Aleutian Islands are located along the northern extent of the “Ring of Fire,” a tectonically and volcanically active region that circles the Pacific Ocean. Because Hawai‘i is located in the middle of the Pacific, we are uniquely exposed to tsunamis originating from large earthquakes anywhere around this Ring of Fire. In Hawai‘i, we consider an event like the April 1, 1946, Aleutian earthquake a teleseism (distant earthquake). Likewise, we can refer to the accompanying tsunami as a tele-tsunami (one that originates from a source usually more than 1000 km, or 600 mi, away). In addition to concerns about tele-tsunamis, Hawai‘i also faces the threat of local tsunamis generated by earthquakes that occur on or near the island. 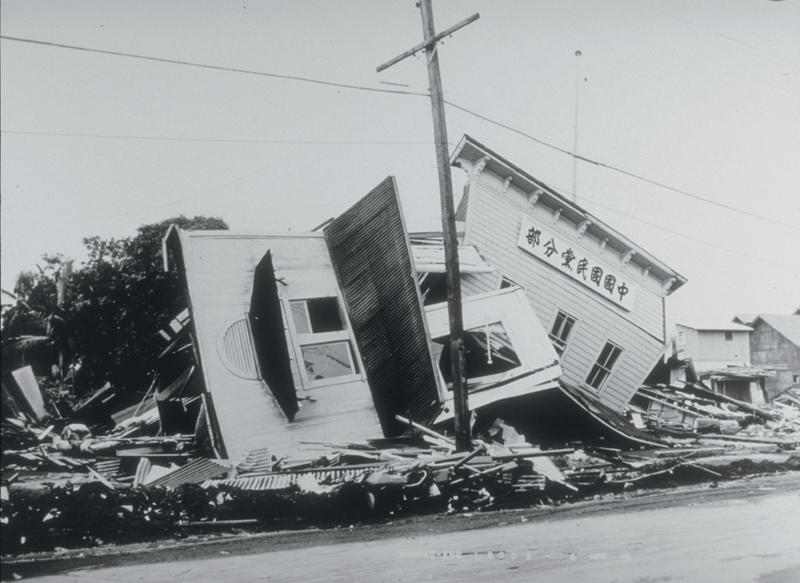 In 1868 and 1975, Hawai‘i experienced deadly tsunamis associated with large local earthquakes centered on the island’s southeastern coastline. In both cases, the fatalities occurred close to where the tsunamis originated—essentially within the area where the earthquake slip occurred. Seismic waves travel through Earth faster than water waves cross the ocean. Using this knowledge, Thomas A. Jaggar, Jr., founder of the Hawaiian Volcano Observatory, pioneered forecasting tsunamis in Hawaii in 1922. Results of his predictions in 1923 and 1927 were mixed, but in 1933, after identifying a teleseism from Japan, Jaggar and his colleagues agreed that a tsunami was possible and issued warnings to Hilo and Kona. People heeded these warnings and moved out of harm’s way prior to the arrival of the tsunami, so no lives were lost. In May 1960, a tsunami produced by the largest earthquake ever recorded—a magnitude 9.5 quake that ruptured a 1000-km- (600-mi-) long section of Chile’s coast—devastated Hilo and took thousands of lives throughout the Pacific region. This disaster prompted the global community to establish the International Tsunami Warning System in 1965. Today, the Pacific Tsunami Warning Center on O‘ahu (ptwc.weather.gov/) provides warnings for Pacific basin tele-tsunamis to coastal populations throughout the Pacific. When a large, tsunami-producing earthquake occurs, PTWC’s principal goal is to locate the earthquake and forecast the tsunami behavior with adequate time to issue warnings to potentially affected areas. The farther a tsunami has to travel, the more time there is between the warning and arrival of the tsunami. In 1946, the tsunami generated by the Aleutian earthquake—some 3,700 km (2,300 mi) from Hawai‘i—took slightly less than 5 hours to cross the ocean and reach Hawaiian coastlines. In 1960, the devastating tsunami from the Chilean earthquake—roughly 10,900 km (6,800 mi) from Hawai‘i— took about 15 hours to strike Hilo. While the Aleutian earthquake and tsunami provided less warning time, those hours of advance notice can be critical and do afford people an opportunity to evacuate. Tsunamis produced by local earthquakes are quite different because their travel distances are much shorter. Rather than taking hours to cross the ocean, locally-generated tsunamis can strike Hawaiian shorelines within minutes. In these cases, survival depends on being aware and taking quick action. For instance, if you feel a strong earthquake while at the beach, you should immediately move to higher ground—a tsunami wave can come ashore before warning sirens can alert you to the potential danger.